Blossoming As A Blogger! Some Personal Reflections and Tips! If you where here and it being Spring, I'd ask you to take a walk with me through a tulip garden. We'd get acquainted and I'd tell you how I’ve always been drawn to blogs. Back when they were mere online journals and a bunch of threads. We'd laugh and I'd share about my past blogs, how I never shared them or promoted them publicly; only sending the link to my family and friends to keep up with me. It simplified writing several e-mails and attaching a gazillion pictures, about by escapades, moving to San Fransisco without knowing a soul there, and when I gave up everything to travel the world with a backpack and my thoughts. What have I learned from blogging? Inevitably you'd ask about Unbelievably Human the blog that I have today, and what I've learned. 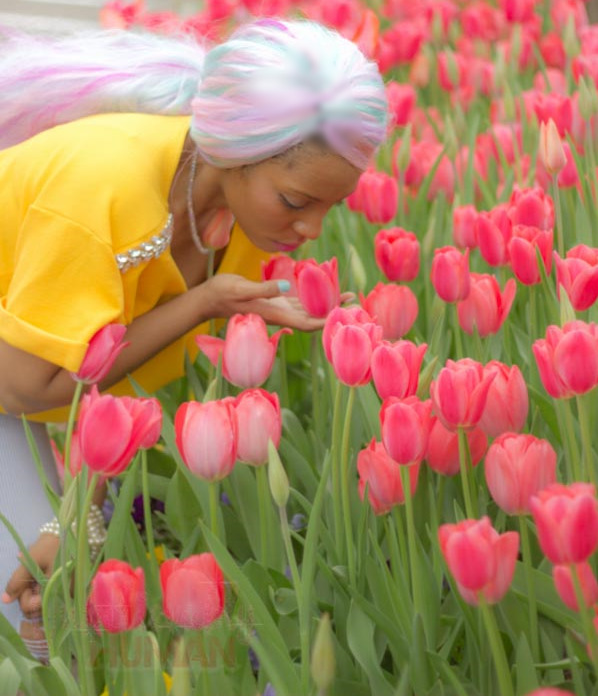 Given this blog isn't even two years old yet, and was selected as a voice of the year by BlogHer; I'd want to stop our stroll through the tulip garden to sit and answer reflectively. This is definitely an intentional blog, promoting love for self,others, and life through creative expression! So, naturally, I'd share pass a couple common thoughts that immediately come to mind, like commitment, setting a schedule, good images and complimenting content! Instead, I’d share three things that I’ve learned "hard" that are more the heart of the matter, and can be applicable in any creative/entrepreneurial endeavor, where budding and blooming occur! 1. You don’t have to be perfect upfront. There is a lot of stock and talk put on brand and branding. The thing to remember is that brands evolve. Take apple for example not only did their logo evolve but so did their company. Don’t be afraid to change and explore your greatest creative and expressive fancies! Doing so keeps you true to yourself and excited about what you do and pushing yourself to your fullest potential! 2. There is no “right” or no real “rules” Blogging is a lot like photography. If you have an Instagram, take,edit, or are a photo taker of any kind. You know the first rule is do what you like. There are a lot of tips and tricks out there that make for “good” photos or in this case good blogs, blog post, and other creative endeavors. It’s up to you to find your style,rhythm, and post patterns that work for you. You should find freedom in being yourself and sharing what interest you. Take tips and tricks, but always be sure to make them your own, and even to create your own. Who knows you may create a whole new “style”. Look at Pinterest! 3. Collaborations. Collaborations can be like Goldie Locks and the three little bears. Be it blogger collabs, advertisers, photographers, and vendors. They can be the best thing ever, the worse thing ever, or just not quite right. It can be tough, at first, to suss out the best collaborations, especially, sense many collaborations start off well. Lots of planning happens and then the collaboration begins. You’re pumped, excited and everything seems to be on the same page but then you start to get a sense that things are “off”. It can be tough to know what to do. You really have a vision for what you want and goals you want to reach! AND blogging can be a small world after all. Here is what I’ve learned, you have to go with what you’re sussing, seriously! If it feels great and all is going well then it’s going to be great. If it starts out “weird” it may certainly be a sign that it’s not quite right. In all of it, make sure that you honor yourself and you’ve clearly communicated what the collaborative expectations are. Remember that even though it feels like more work to look or start something new, it’s half the work you'll have to do fixing what went arwy. Don’t loose faith and don’t take it personal.....seriously don't take it personal. The best collaborations lead to great heights and it’s worth making space for the ones that make for great experiences for everyone involved. I hope these have been helpful and that you continue to BLOOM like the beautiful tulips in this post!